TRP Consulting is playing a key role in the creation of Lancashire’s emerging Samlesbury Aerospace Enterprise Zone as its relationship with BAE Systems continues to develop. 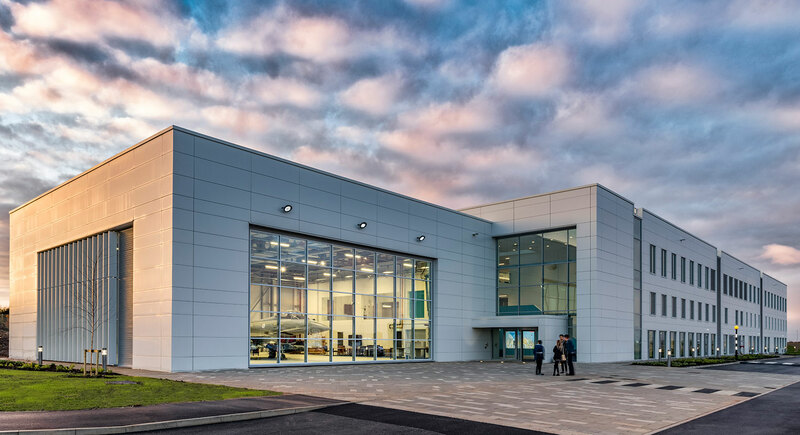 Our engineering expertise was utilised in the construction of the aerospace company’s impressive new £15.6m training academy – the largest investment in skills in the UK’s aerospace sector. The 7,400 sq metre academy has 26 classrooms and has been designed and built from scratch over three years. TRP’s expert team worked on the structural development of the project from conception to completion. TRP Consulting is also working as structural engineer on a new Defence Logistics Centre, which is also sited on the emerging Enterprise Zone. The 17,500 sq metre logistics hub, with a long span mezzanine storage area is one of the first buildings on the enterprise zone and, alongside the academy, is set to act as catalyst for further development. The new Academy for Skills & Knowledge (ASK) offers an unrivalled modern engineering and manufacturing environment in which aerospace giant BAE Systems can deliver the highest quality training. The ground floor includes 6m high workshop areas, the first floor of the building contains all teaching and office spaces and a mezzanine floor links the two with teaching and heritage spaces. TRP has been involved in several major construction projects on BAE Systems’ Samlesbury site over the past eight years. Those developments have ranged in value from £5m to £25m and include machine and assembly shops associated with the major F35 Lightning ll fighter project. Our team worked on the major extension to the production line at the Lancashire plane-making plant that delivers the aft section of the aircraft. They helped develop the steel frame building that incorporates an 82m clear span lattice roof structure and an engineered strong floor to accept point loads from the assembly system. TRP Consulting’s engineering solutions included 4.5m deep foundations needed to ensure the high accuracy performance of BAE Systems’ specialist machine tools. We have also worked on building projects at BAE Systems’ Warton facility also in Lancashire. TRP Consulting director Tim Royle said of the academy opening: “We are delighted to have played our part in delivering what is the single biggest investment in skills in the aerospace industry in our continuing relationship with BAE Systems, one of the world’s great advanced manufacturing organisations. “The company recognises our ability and track record of delivering high-quality engineering consultancy services on major construction projects.